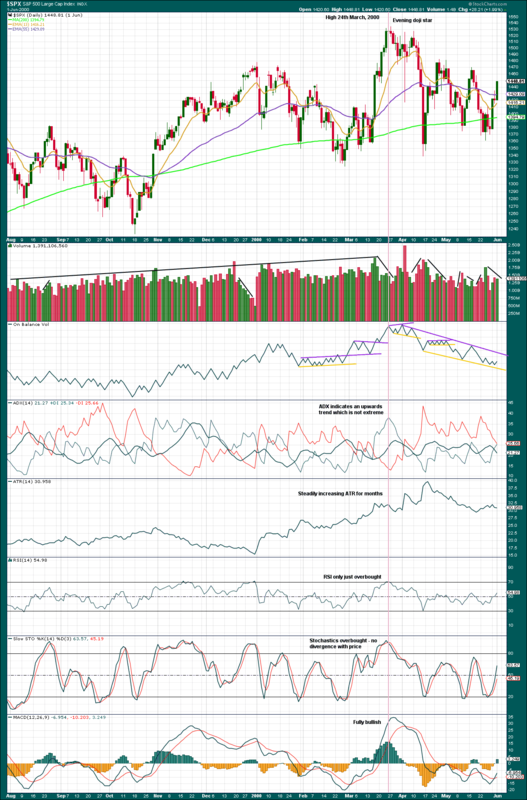 Bearish divergence noted in last analysis between price and breadth and price and volatility has been followed by a downwards day. This was expected. 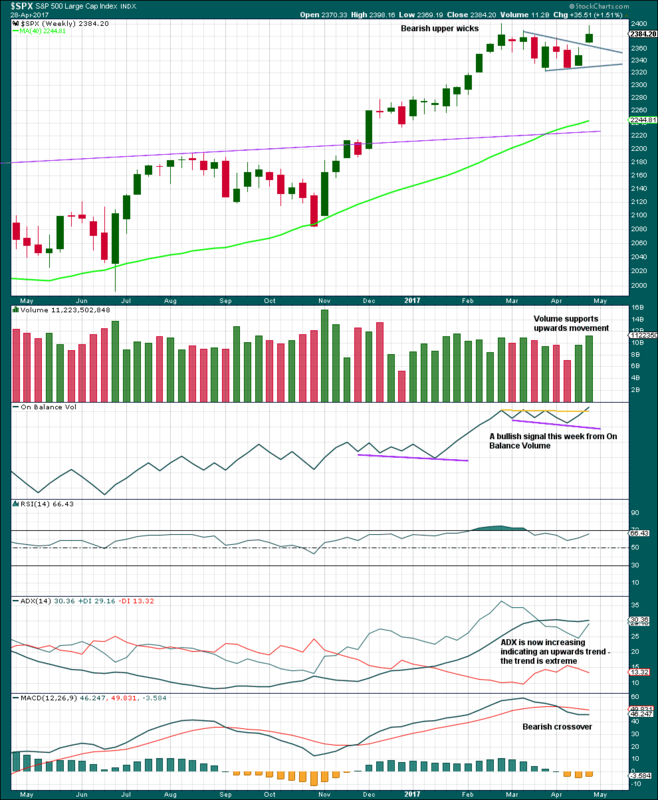 Summary: The bigger picture sees the S&P now in a primary degree pullback to last a minimum of 8 weeks and find support at the maroon channel on the weekly chart. Watch the upper blue trend line on the main hourly chart carefully. If price breaks above it, then look for upwards movement to end somewhere in the zone of 2,466 to 2,477. A new high above 2,453.71 would provide price confidence in this view. However, the short term trend remains the same (down) until proven otherwise. Assume new lows are ahead while price remains below the blue trend line. The short term target for a third wave down is still at 2,389. If price moves above 2,474.93, then use the alternate hourly chart. Primary wave 3 now looks complete. 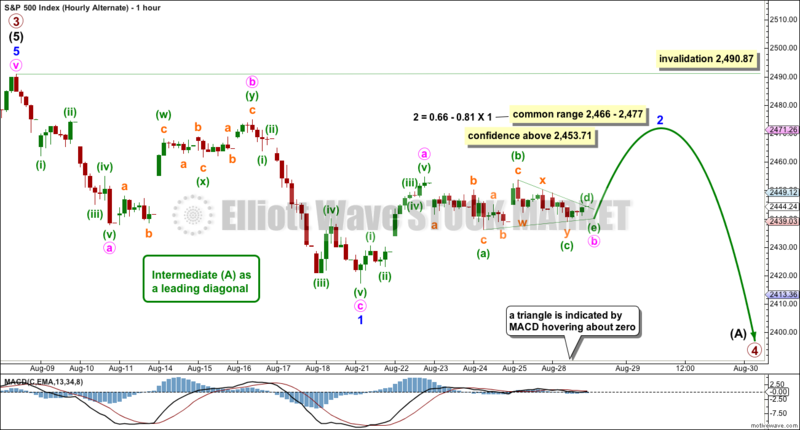 Further and substantial confidence may be had if price makes a new low below 2,405.70, which is the start of minor wave 5 within intermediate wave (5). A new low below 2,405.70 may not be a second wave correction within an extending fifth wave, so at that stage the final fifth wave must be over. Fibonacci ratios are calculated at primary and intermediate degree. If primary wave 3 is complete, then it still exhibits the most common Fibonacci ratio to primary wave 1. Primary wave 4 should last about 8 weeks minimum for it to have reasonable proportion with primary wave 2. It is the proportion between corrective waves which give a wave count the right look. 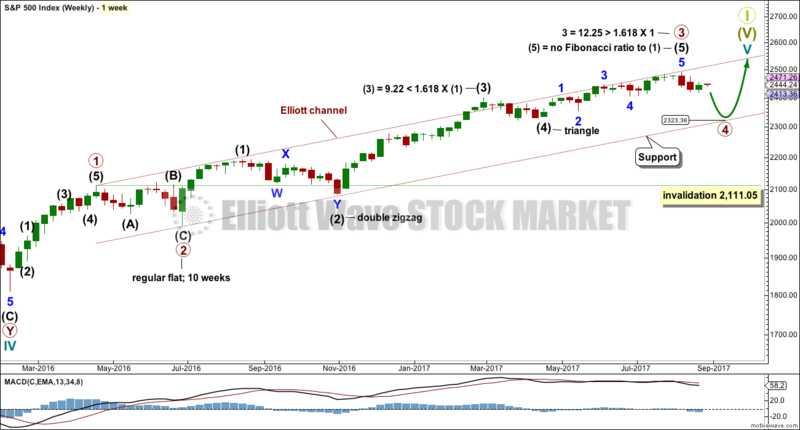 Primary wave 4 may last 13 or even 21 weeks if it is a triangle or combination. So far it has lasted only two weeks. If primary wave 4 reaches down to the lower edge of the Elliott channel, it may end about 2,325. This is within the range of intermediate wave (4); fourth waves often end within the price territory of the fourth wave of one lesser degree, or very close to it. 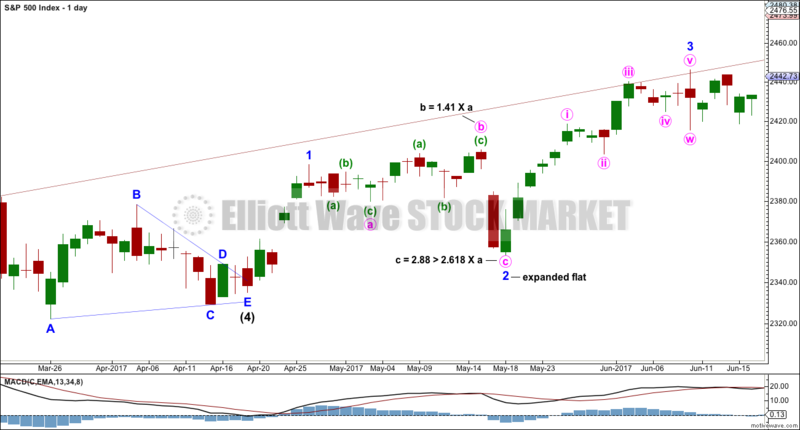 The final target for Grand Super Cycle wave I to end is at 2,500 where cycle wave V would reach equality in length with cycle wave I. If price reaches the target at 2,500 and either the structure is incomplete or price keeps rising, then the next target would be the next Fibonacci ratio in the sequence between cycle waves I and V. At 2,926 cycle wave V would reach 1.618 the length of cycle wave I. 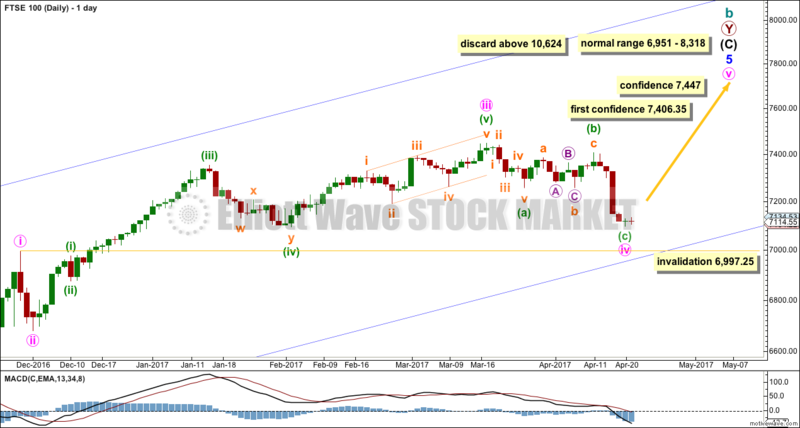 The daily chart will now focus in on the unfolding structure of primary wave 4. Primary wave 2 was a regular flat correction lasting 10 weeks. Given the guideline of alternation, primary wave 4 may most likely be a single or double zigzag. Within both of those structures, a five down at the daily chart level should unfold. At this stage, that looks incomplete. While primary wave 4 would most likely be a single or double zigzag, it does not have to be. It may be a combination or triangle and still exhibit structural alternation with primary wave 2. There are multiple structural options available for primary wave 4, so it is impossible for me to tell you with any confidence which one it will be. It will be essential that flexibility is applied to the wave count while it unfolds. Multiple alternates will be required at times, and members must be ready to switch from bear to bull and back again for short term swings within this correction. While intermediate wave (A) is labelled as an unfolding impulse, it may also be a diagonal. Both structures are considered at the hourly chart level. Intermediate wave (A) may also be a zigzag if primary wave 4 is to be a triangle. 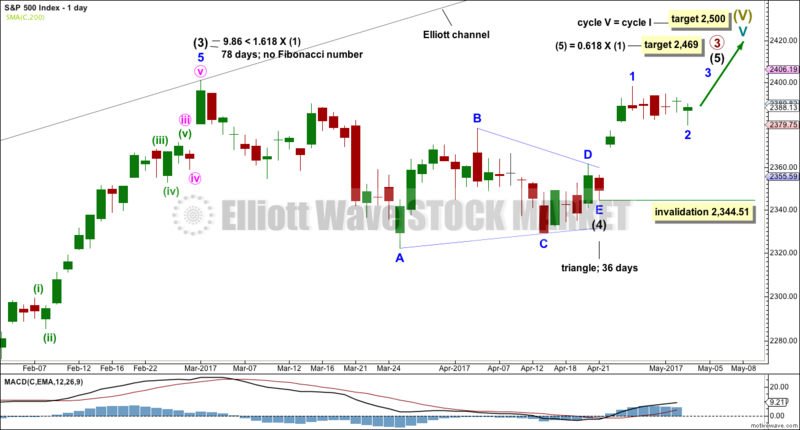 So far it is possible a zigzag downwards could be complete, but it is not deep enough for wave A of a triangle when it is viewed on the weekly chart. And so that possibility will not be considered at this time. Minor wave 1 downwards looks very clear as a five wave structure. Minor wave 2 upwards ended just above the 0.618 Fibonacci ratio. 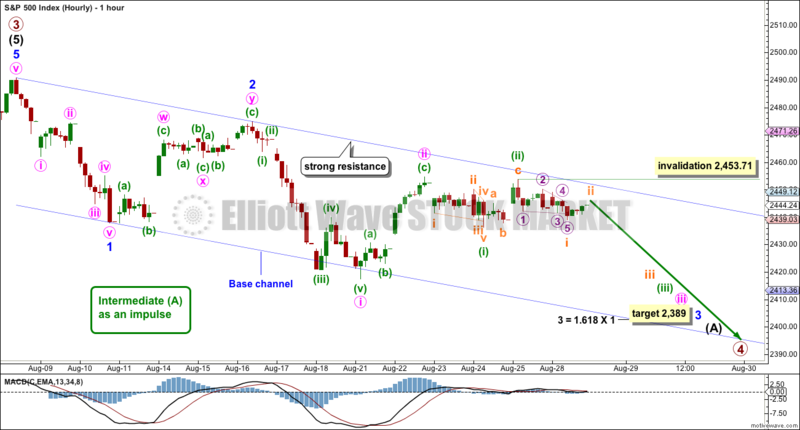 Minor wave 3 downwards has now made a new low below the end of minor wave 1, meeting the Elliott wave rule. Minor wave 3 now exhibits slightly stronger momentum than minor wave 1. A further increase in downwards momentum would be expected. Minuette wave (i) will fit as a leading contracting diagonal. 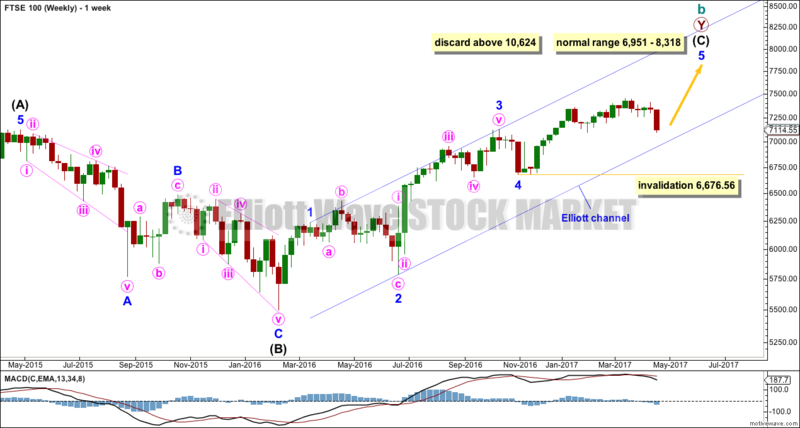 Minuette wave (ii) may now be a completed deep zigzag. Another leading contracting diagonal may have completed today for subminuette wave i. Subminuette wave ii may not move beyond the start of subminuette wave i above 2,453.71. If price moves higher above the upper edge of the base channel, then the alternate below should be preferred as soon as that trend line is breached and before the invalidation point is passed. The target expects minor wave 3 to be an extension. When third waves extend, they do so both in price and time. They often show their subdivisions at higher time frames, which is why minute waves ii and iv may show up on the daily chart. Minute wave iii may also be extending; it is common for the middle of third waves to extend and be stretched out. With minute wave iii extending, it too may show its subdivisions at the daily chart level. If the base channel on the main hourly chart is breached by upwards movement, use this alternate. The other possible structure for intermediate wave (A), if it is to be a five, would be a leading diagonal. These are not as common as impulses, so this must be an alternate wave count judged to have a lower probability than the main wave count. However, low probability does not mean no probability. All possibilities should be considered. Within leading diagonals, the first, third and fifth waves are most commonly zigzags. They may also appear to be impulses. Here, minor wave 1 will fit as a zigzag. Second and fourth waves must be zigzags. 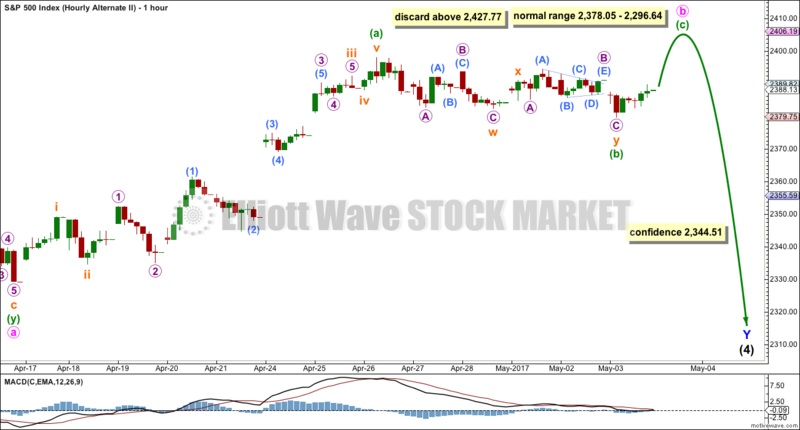 Minor wave 2 may not move beyond the start of minor wave 1 above 2,490.87. 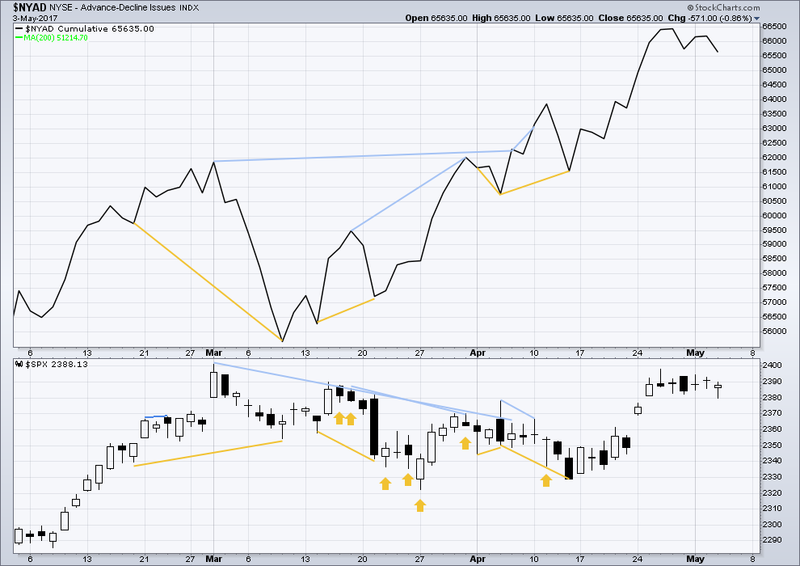 Sideways movement of the last four sessions fits well as a triangle. This is supported by MACD hovering about zero. So far the triangle adheres well to its trend lines; this looks correct. If a triangle is unfolding as it is labelled here, then the breakout should be upwards. Second and fourth waves within diagonals are usually very deep; a range is given for the common depth. Minor wave 3 would have to move below the end of minor wave 1 at 2,417.35. Minor wave 3 downwards of a leading diagonal should still exhibit an increase in downwards momentum and should still have support from volume. Last week has made a lower low and lower high, but the candlestick closed green and the balance of volume was upwards. Lighter volume does not support the rise in price during the week. 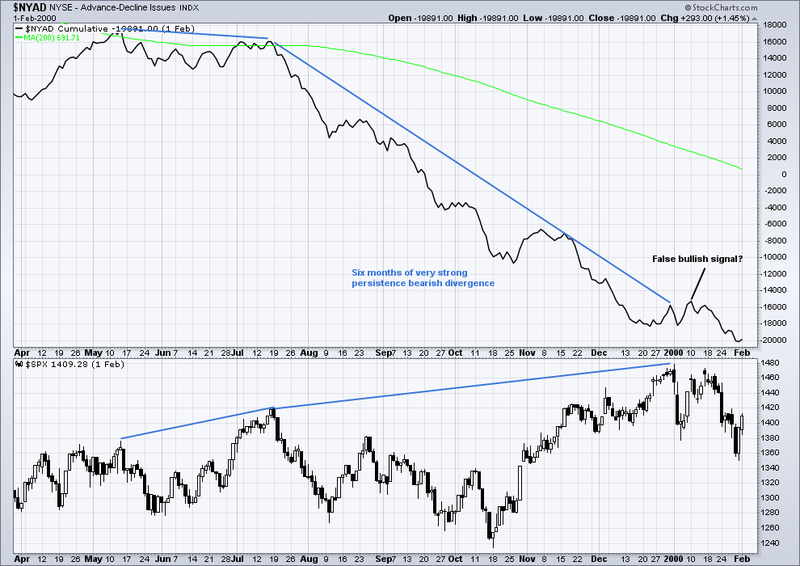 ADX had been extreme for a long time and is now declining. 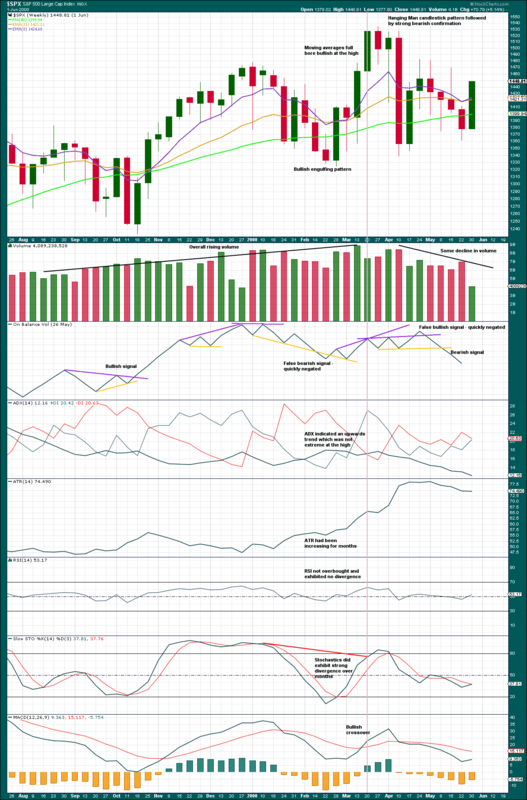 The black ADX line is now declining but has not yet been pulled down below both directional lines, so the consolidation or pullback may be expected to continue. 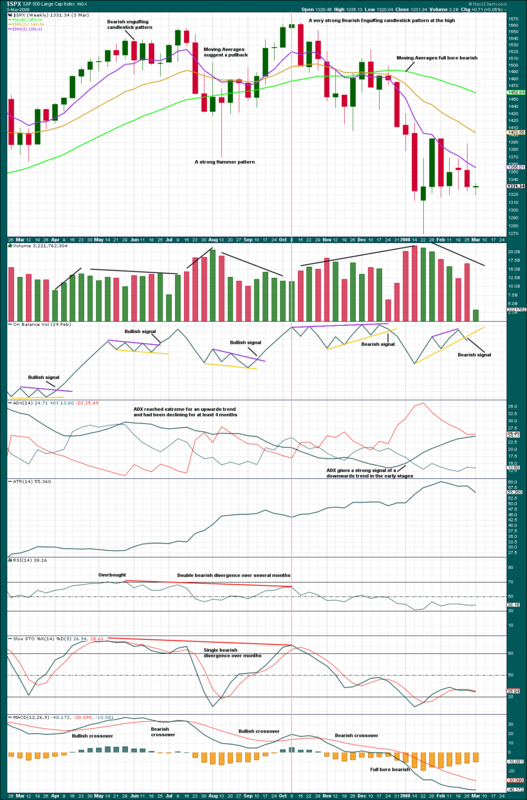 For the last four sessions, price has been moving sideways and volume overall has been declining. A small pennant pattern may be forming. But volume is strongest on a downwards day within this small consolidation suggesting a downwards breakout is more likely. However, the pennant pattern suggests an upwards breakout. A target using the measured rule for the possible pennant would be about 2,487. On Balance Volume suggests that any upwards movement may be limited. 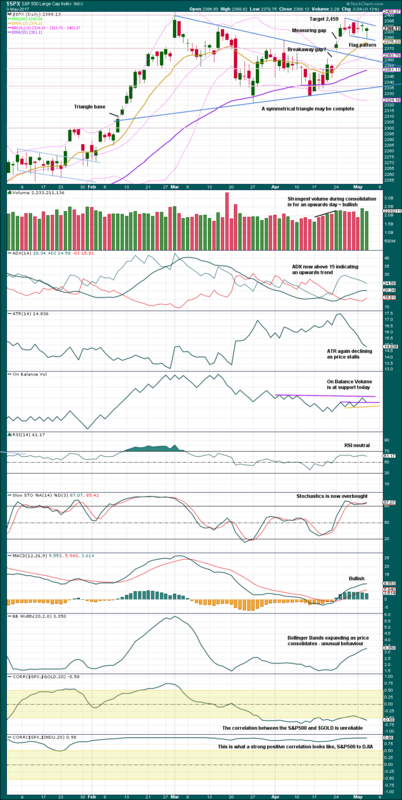 Watch On Balance Volume carefully over the next few days. 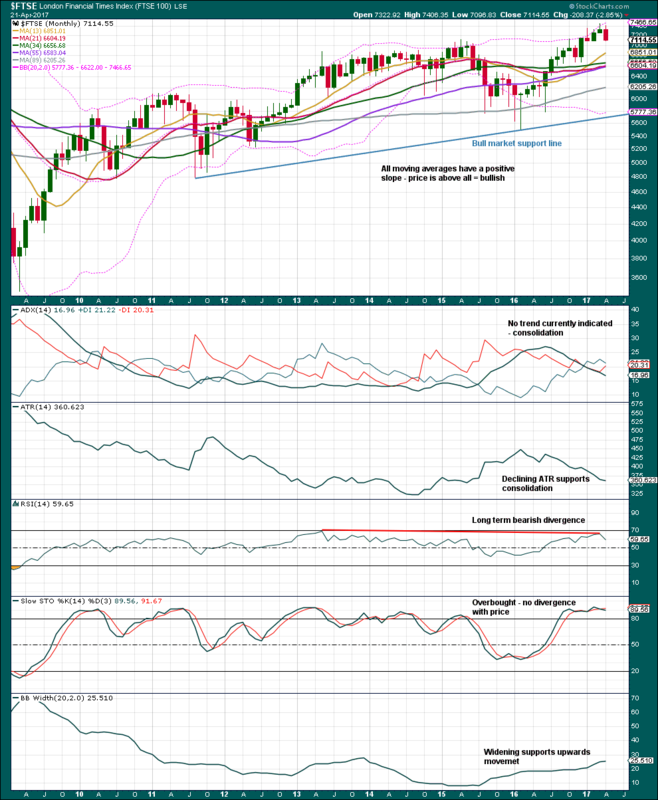 A breakout there may indicate the next direction for price. 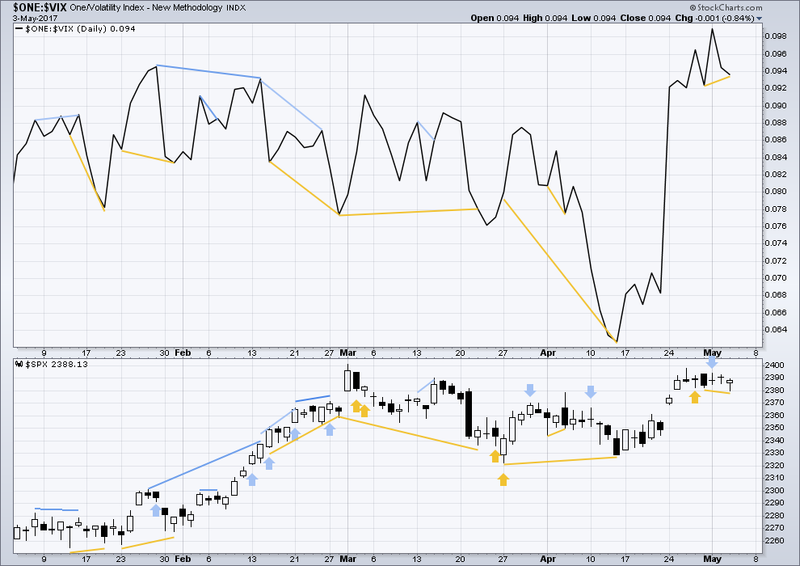 Bearish divergence noted in last analysis between price and inverted VIX has now been followed by one downwards day. It may now be resolved, or it may need one more downwards day to resolve it. There is no new divergence today. With the last all time high for price, the AD line also made a new all time high. 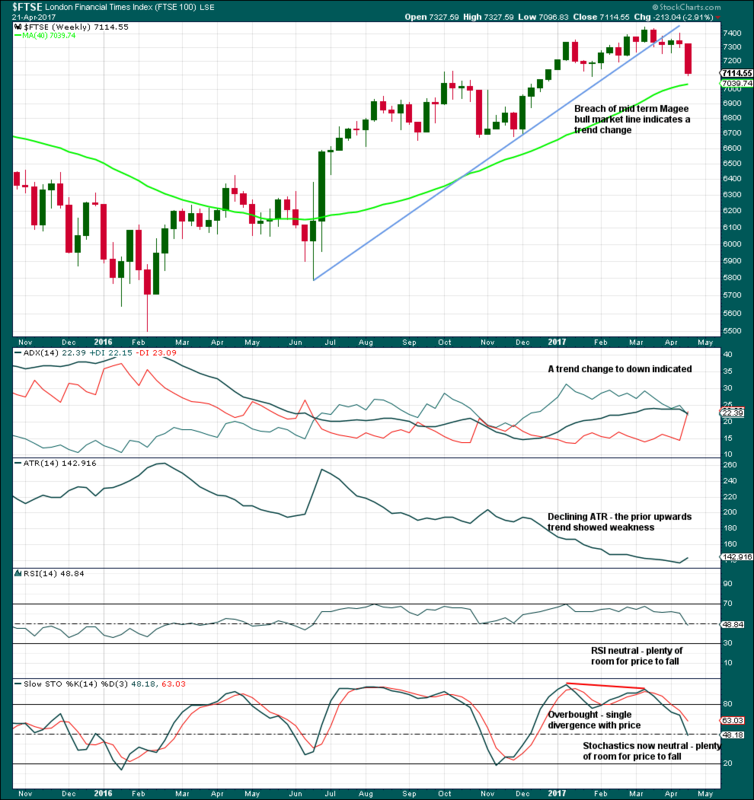 Up to the last high for price there was support from rising market breadth. 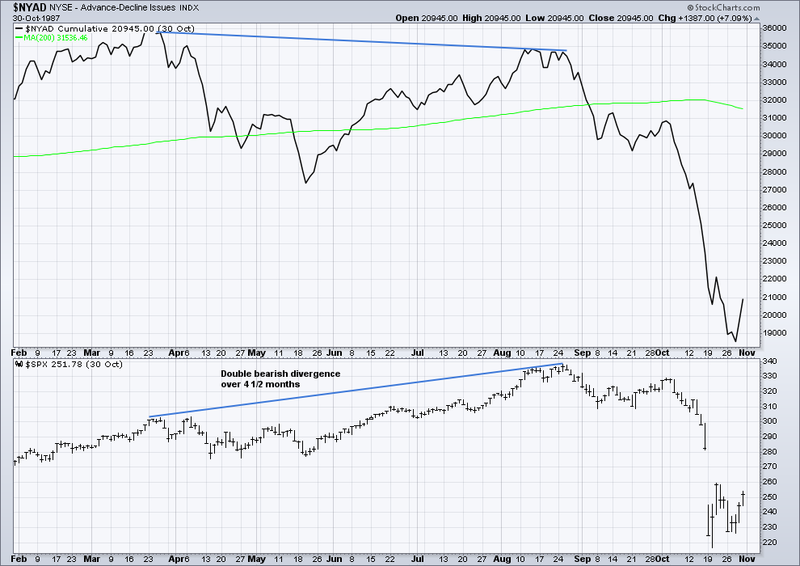 There is normally 4-6 months divergence between price and market breadth prior to a full fledged bear market. This has been so for all major bear markets within the last 90 odd years. With no divergence yet at this point, any decline in price should be expected to be a pullback within an ongoing bull market and not necessarily the start of a bear market. 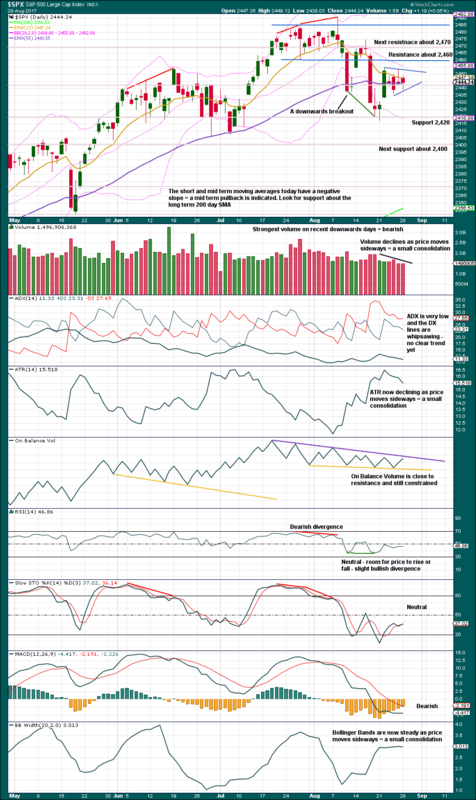 Short term bearish divergence noted in last analysis has now been followed by one downwards day. It may be resolved here or it may need one more downwards day to resolve it. 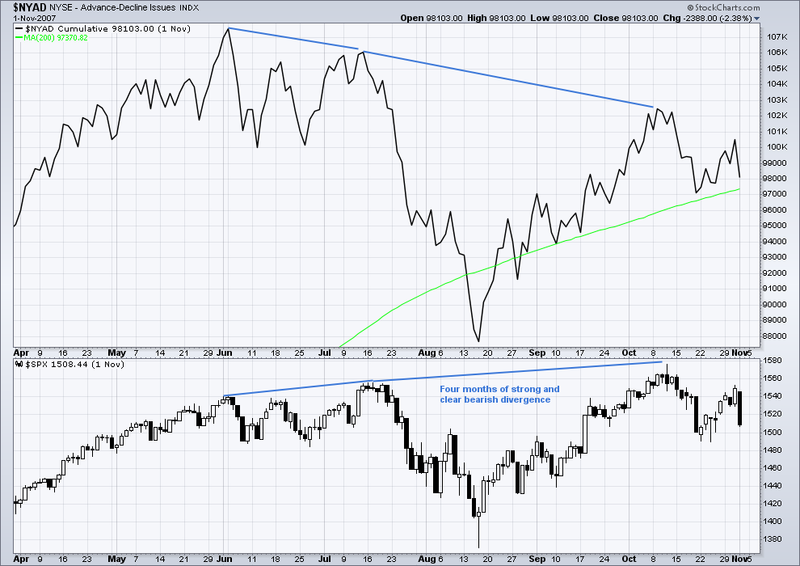 There is no new divergence today between price and the AD line. The S&P500, DJIA, DJT and Nasdaq have all made new all time highs recently. 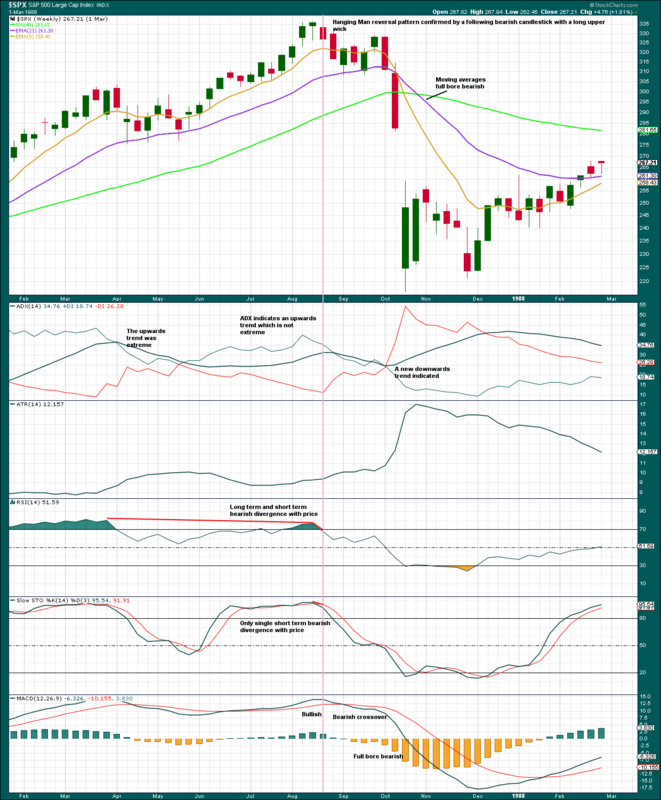 Modified Dow Theory (adding in technology as a barometer of our modern economy) sees all indices confirming the ongoing bull market. Published @ 09:50 p.m. EST. 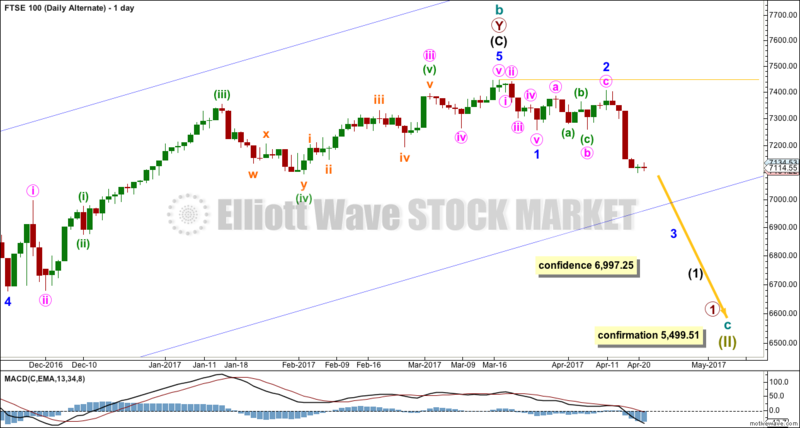 This video is of the process of developing an alternate Elliott wave count for the S&P 500, using the MotiveWave analysis platform, and shows the steps I go through and my train of thought. The consolidation continues sideways and support is still at about 2,380. Summary: A small flag pattern may be completing. Volume suggests the breakout is more likely to be upwards. The measured rule gives a target about 2,459. 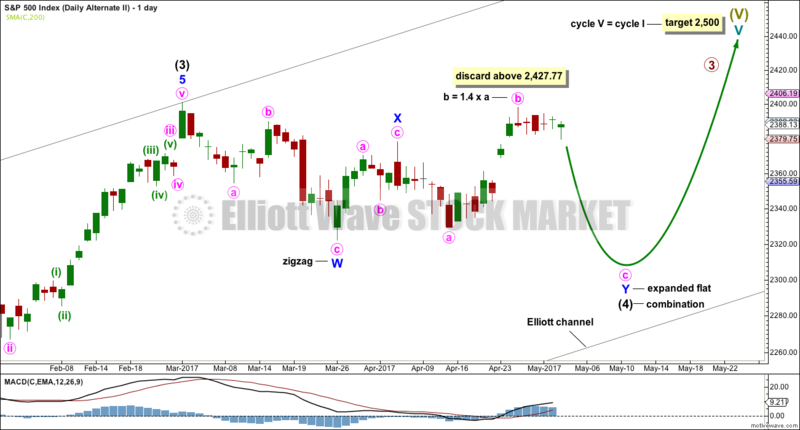 The Elliott wave analysis gives a target about 2,469. Support continues to hold about 2,380. If the last gap is closed with a new low below 2,376, then it would be an exhaustion gap. If that happens, then expect price to move substantially lower to make at least a slight new low below 2,328.95. 2. Invest only 1-5% of equity on any one trade. 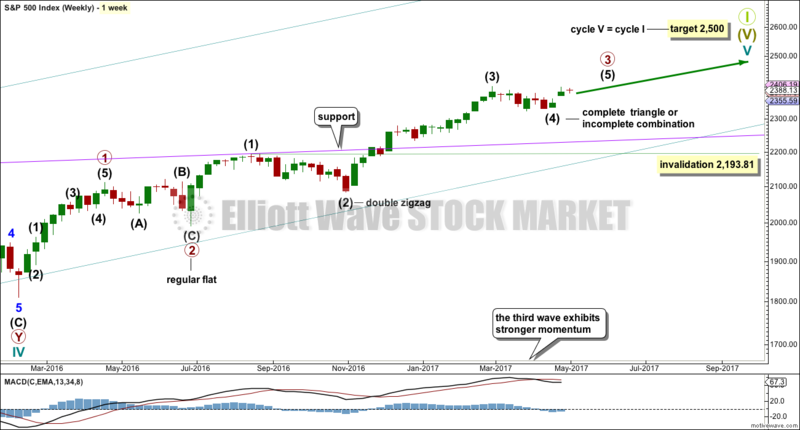 This wave count sees the middle of primary wave 3 a stretched out extension, which is the most typical scenario for this market. Primary wave 3 may be incomplete. A target is now calculated for it on the daily chart. There is alternation within primary wave 3 impulse, between the double zigzag of intermediate wave (2) and the possible triangle or combination of intermediate wave (4). When primary wave 3 is a complete impulse, then a large correction would be expected for primary wave 4. This may be shallow. Thereafter, primary wave 5 may be expected to be relatively short, ending about the final target at 2,500. Primary wave (4) may be a complete regular contracting triangle. It may have come to a surprisingly swift end with a very brief E wave. There is already a Fibonacci ratio between intermediate waves (3) and (1). This makes it a little less likely that intermediate wave (5) will exhibit a Fibonacci ratio to either of intermediate waves (1) or (3); the S&P often exhibits a Fibonacci ratio between two of its three actionary waves but does not between all three. Within intermediate wave (5), no second wave correction may move beyond the start of its first wave below 2,344.51. The triangle may have come to a surprisingly quick end. Triangles normally take their time, so this quick end does slightly reduce the probability of this first wave count. A rare running flat within minor wave D of the triangle also slightly reduces the probability. For these reasons an alternate is provided below. If the triangle is over, then the next wave up has begun. A five up may be complete. Minor wave 2 can be seen as a complete corrective structure, a double combination. These are very common structures. The first structure in the double labelled minute wave w is a zigzag. The second structure within the double labelled minute wave y is a regular flat correction. If the last gap is correctly named as a measuring gap, then it may not be filled; the lower edge may provide support. If this is the case, then minor wave 2 may be a relatively shallow correction. Within a new trend for this market, the early second wave corrections are often surprisingly brief and shallow. If price closes the gap, then use the 0.618 Fibonacci ratio as the next target for minor wave 2. 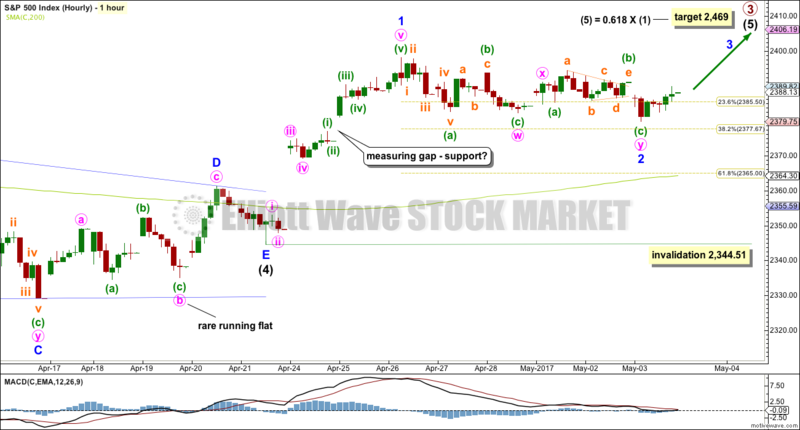 However, this wave count may switch to an alternate and the alternate below may become the main wave count if the gap is closed. Minor wave 2 may not move beyond the start of minor wave 1 below 2,344.51. If price does make a new low below 2,344.51, then the alternate below shall be used. What if intermediate wave (4) was not a complete triangle but is still unfolding as a double combination? Double combinations are very common structures. This would still provide perfect alternation in structure with the double zigzag of intermediate wave (2). Although double zigzags and double combinations are both labelled W-X-Y, they are very different structures and belong to different groups of corrections. The purpose of combinations is the same as triangles, to take up time and move price sideways. Intermediate wave (2) lasted 58 days. So far intermediate wave (4) has lasted 44 days. If it continues for another two or three weeks, it would still have excellent proportion with intermediate wave (2). 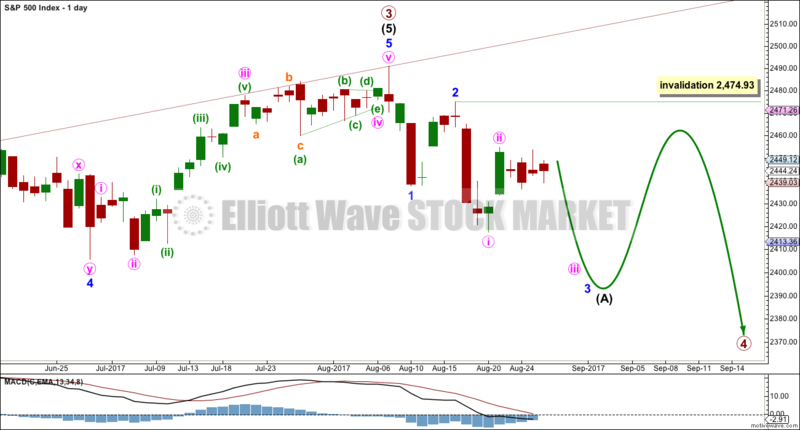 Although this wave count actually has a better look than the main wave count, it does not have support from classic technical analysis. For this reason it will be published as an alternate with a lower probability. The problem of the running flat within the main wave count is here resolved. The second structure of the combination for the larger correction of intermediate wave (4) may be an expanded flat labelled minor wave Y. There is no rule regarding the maximum length of B waves within flats, but there is an Elliott wave convention that states when the potential B wave reaches twice the length of the A wave the idea of a flat should be discarded based upon a very low probability. That price point would be at 2,427.77. The zigzag for minute wave b upwards may be incomplete. Sideways movement for the last five days is seen in exactly the same way now for both wave counts, as a double combination. This may be minuette wave (b) and may now be complete. This chart is bullish and strongly supports the main wave count. However, it is concerning that ADX is extreme. This does not mean price must turn down here; it only puts some doubt on how much further price can go up. So far the last gap labelled a measuring gap is holding support. Assume this gap is a measuring gap while it remains open, until proven otherwise. Sideways movement for the last five sessions now looks like a bull flag pattern, one of the most reliable continuation patterns. There are now at least two anchor points for the resistance and support lines, so these lines may now be drawn. The pattern has a downwards slope and that increases its effectiveness. However, volume is not declining as price moves sideways. This does not rule out a flag pattern, but it is nice to see consolidations supported by declining volume. During the consolidation it is upwards days which have strongest volume, suggesting an upwards breakout is more likely than downwards. The measured rule uses the start of the flag pole on the 13th of April to its end on the 26th of April. This length is applied to an approximate breakout point about 2,390 giving a target about 2,459. A classic breakout would be an upwards day closing above the resistance line with an increase in volume. During a trend Stochastics may remain extreme for long periods of time. 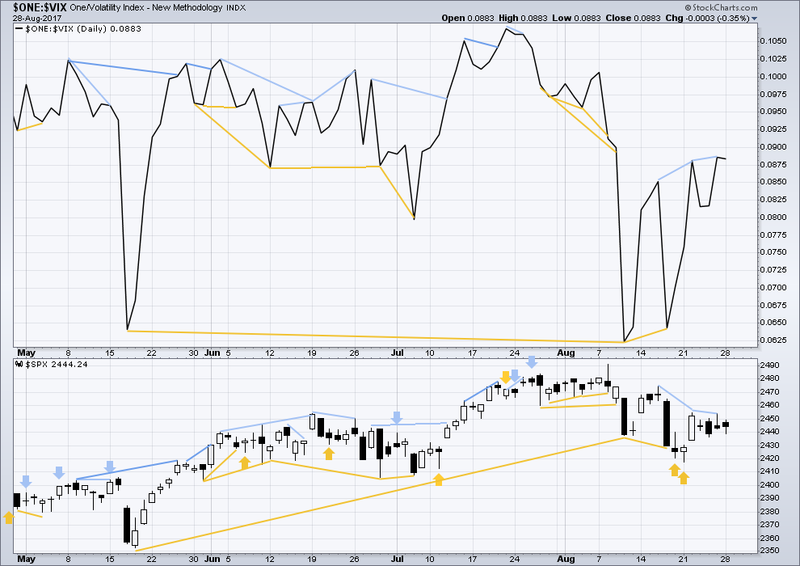 Overbought Stochastics does not signal price must move down here. 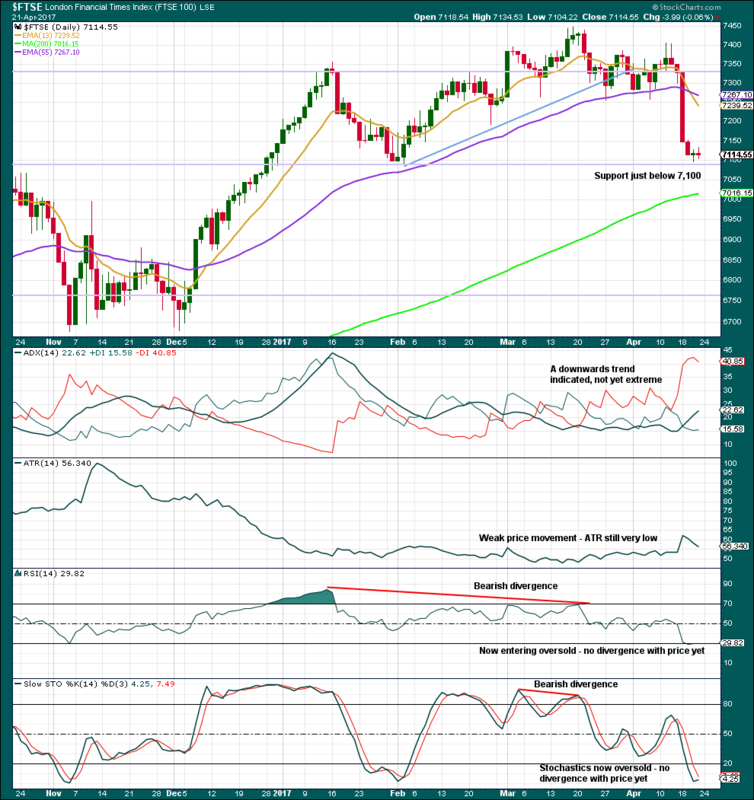 Only when Stochastics has remained extreme and then exhibits divergence with price, preferably multiple divergence, is it a strong warning of an impending trend change. That is not the case yet. 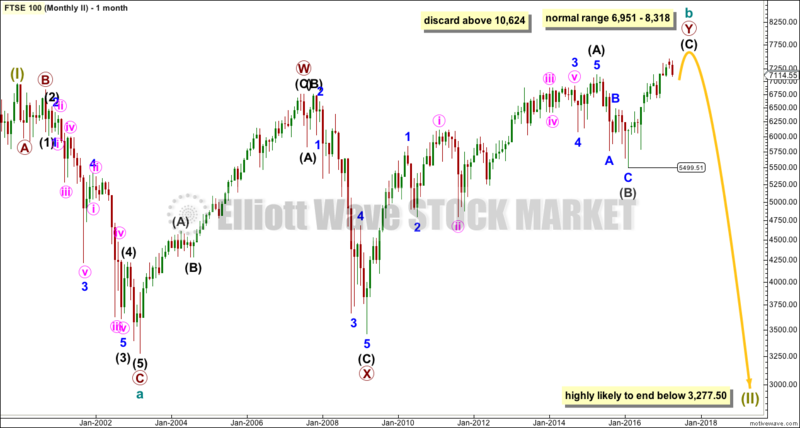 This classic analysis offers more support for the main Elliott wave count than the alternate. 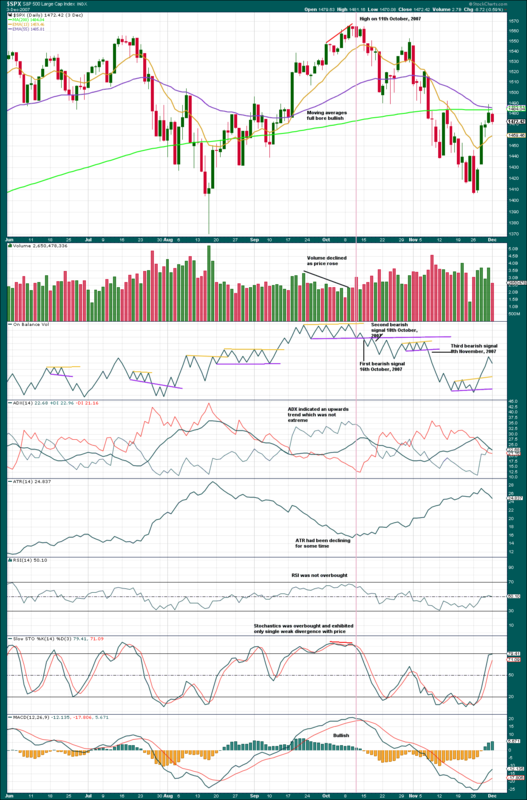 It is noted that there are now six multi day instances of bullish divergence between price and inverted VIX, and all have been followed so far by at least one upwards day if not more. This signal seems to again be working more often than not. It will again be given some weight in analysis. 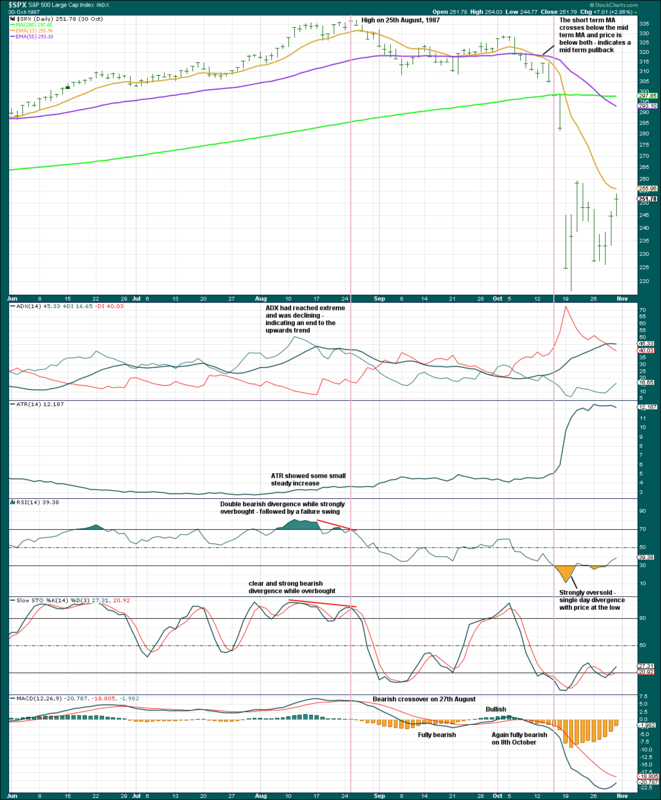 There is weak short term bullish divergence today between price and inverted VIX: price has made a slight new low below the low three days ago, but VIX has not made a corresponding new low. This indicates weakness in downwards movement from price today and is bullish. 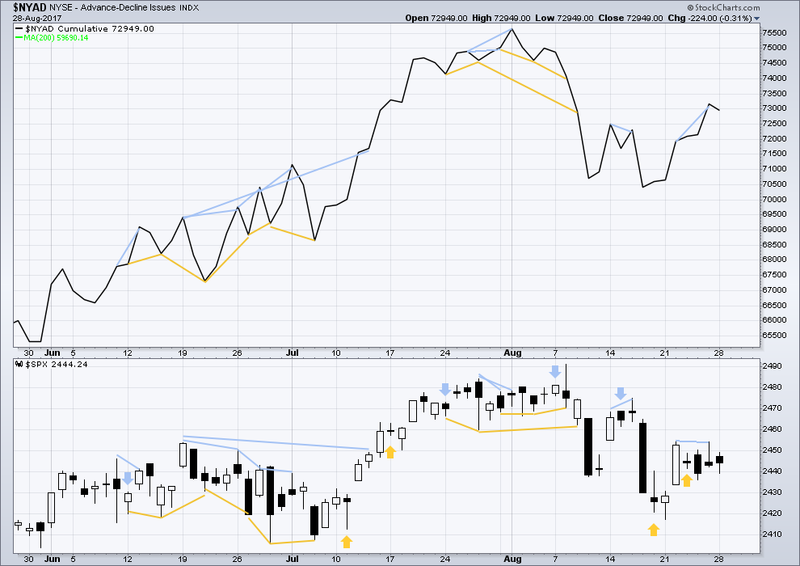 No new divergence is noted today between price and the AD line. 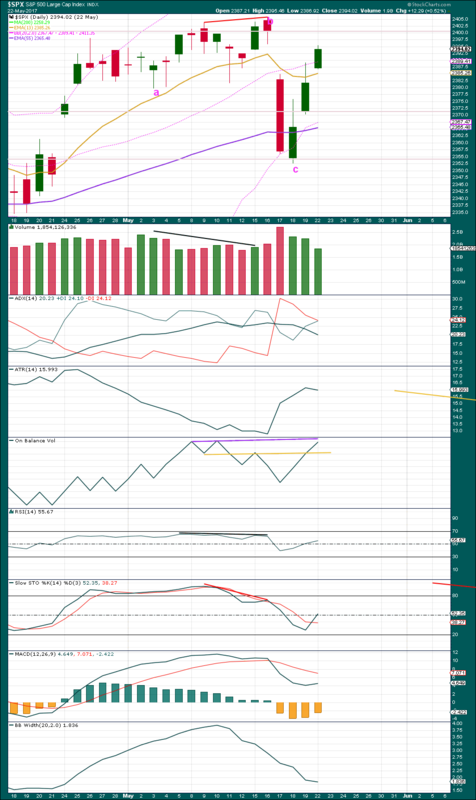 There is still longer term bearish divergence, but this has not proven reliable lately, so it will not be considered. 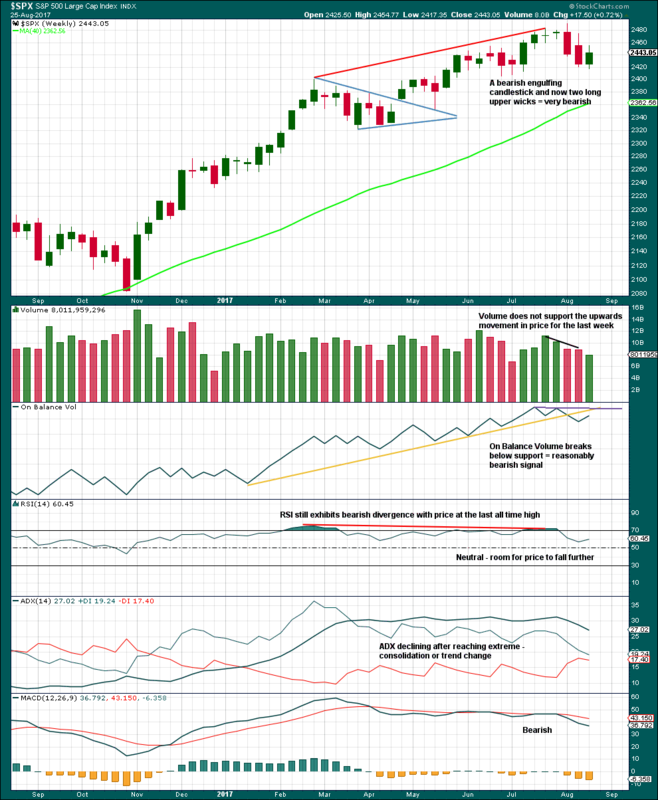 The DJIA, DJT, S&P500 and Nasdaq continue to make new all time highs. This confirms a bull market continues. This analysis is published @ 09:17 p.m. EST.